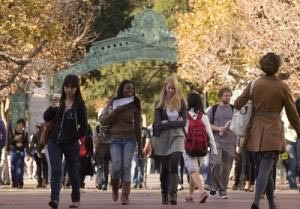 Nearly one-quarter of University of California students, staff and faculty members say they have felt excluded, intimidated or on the receiving end of hostile or offensive behavior while at school or work, according to results from a survey released Wednesday. The survey represents the public college system's most comprehensive attempt to date to gauge the climate at its 10 campuses and major off-campus offices. The 93-item questionnaire emailed to more than 386,000 students and employees last year was part of a broader effort to promote respect and diversity following a series of racially and ethnically charged incidents that included a noose and KKK hood being found at UC San Diego in 2010, complaints about bias from UCLA faculty and staff in 2012, and ongoing tensions between Palestinian supporters and Jewish students at several schools. It found high levels of satisfaction overall, with 79 percent of the 104,208 respondents saying they were comfortable learning or working at UC. The results varied somewhat among students and faculty who were asked to evaluate the environment specifically in their classes, with 73 percent of undergraduates, 78 percent of graduate students and 56 percent of faculty and postdoctoral scholars saying they were comfortable or very comfortable with the level of respect they experienced there. Of the 24 percent who reported "personal experiences of exclusionary, intimidating, offensive or hostile conduct" in the previous year, 42 percent said they had been intimidated or bullied, 19 percent said they had heard derogatory remarks and 9 percent said they had feared for their physical safety. Another 9 percent said the episodes were serious enough to interfere with their studies or work. Race, religion and ethnicity were not the only sources of friction. "Position" as a student, staff or faculty member was the top reason respondents gave for the disrespect or exclusion they experienced. Age, academic discipline and philosophical views also were cited. The responses were broken down by campus and by such factors as age, race, religion, gender, sexual orientation, citizenship status and disability. UC Provost Aimee Dorr told the university's governing board that managers and administrators would analyze the detailed data to look for areas in which to improve. Regent Eddie Island said he was not sure whether the system can draw many conclusions from the survey given the comparatively low response rate, which ranged from 72 percent at the president's office to 18 percent at UC Riverside. Along with students and employees at the 10 campuses, the survey was administered to personnel at Lawrence Berkeley National Laboratory, the Division of Agriculture and Natural Resources and the UC president's office. What Would A Survey on Campus Diversity Reveal About Your School? Higher prejudice and/or racism among faculty/staff ar UCLA? The article does not say how UCLA is going to make changes, just that there surveys were done to see where changes need to be made. Which has me wondering once the problem is identified; how the issues will be dealt with and when will changes be made. Non-diverse students could have a hard time with the school's population becoming more diverse because they could lose out on opportunities on applications and acceptances as programs on campus will try to fill diverse demographics and select against the non-diverse population. This may be so, but, do you really want students who are going to chose a school based on race? But, beyond this scope, if the school offers such a curriculum that the worlds sees as a good education and or sports exc. then there is no reason that race should become a factor in selectivity. While I agree that it is good to have diversity at a school, I do not believe admission should be based on diversity. The article did not mention what the factors were that went into why so many people felt uncomfortable. It could have been in part the location of the campus and whether it was in the middle of a (high crime rate) city or near a bad neighborhood. I don't believe that the diversity of the school was the main focus of the study. The researchers should have looked into more factors than they did. I agree with you. This study must have more information because based on what I just read I cannot tell if that uncomfortability was bàsed on the diversity. You have a very good point there. I also believe that it is important to student share the ''college experience'' with international student because that is the way to open your mind and learn more about other ways to live. True. Because during interaction with students from different countries we learn a lot of good things and share different experience than keep on excluding others without consider that they may have unique things to share. Its true that our college also have the diversity, as even me I am not in this country but I feel comfortable in interacting with my fellow colleagues, from different parts of the world. As long as we have the common interest of getting the better education and there is no any kind of racism and biasness up to this moment I never see such kind of incident. It amazes me that out of the quarter of people who had felt excluded or uncomfortable at the University of California almost one out of ten people feared their physical safety. While that may seem like a low percentage, it includes a lot of people. If people fear their safety or feel like they are being discriminated, they don't have to stay at that school. I know it isn't an ideal situation that these people find themselves in, but nothing is stopping them from transferring to another school. As mentioned in above comments, there is too much information that we do not have in this article. Therefore, I find it hard to make a fair judgement. Diversity at Park University is the order of the day. There are hardly any classes without international students and/or students from ethnic minorities. "Park boasts over 633 international students from 112 different countries" which is pretty impressive. One has to come to terms with diversity otherwise it is the wrong place to study. Since there are 14 different campuses all over the United States, I can only speak for the one here in Parkville. But this place is amazing in how many different countries are coming together in the Mid West. Here, I learned about cultures that I didn't even know existed before. I agree with this too, i have learned so much just by coming here, and a lot that i have learned, i think will have an effect on me throughout my entire life. I think that is one of the things that makes Park a better university. The fact that there are so many students from a whole variety of countries, the campus is full of culture from all around the world. We learn to live with each other and integrate the ways of life that we've adopted in each other's culture. There's bound to be moments where international students would feel a certain kind of negativity but that doesn't necessarily mean they are being harassed, its comes with cultural shock. They need to figure out who specifically is being discriminated against and what the reason behind it is. Of course all of those demographics are going to play a role in how the independent variable affects the dependent. Once they are able to narrow down who is specifically being discriminated against they need to educated their students (perhaps making a mandatory race a perspectives course for general electives) and have a zero tolerance policy. It's with that that they could eliminate many forms of prejudice on their campus. "Regent Eddie Island said he was not sure whether the system can draw many conclusions from the survey given the comparatively low response rate, which ranged from 72 percent at the president's office to 18 percent at UC Riverside." Then my question is why even make an article about the topic? In inferential statistics you want to generalize to the population, but, you can't generalize it if your sample is too low. Get a higher turn out with more diversity and then come to a conclusive result. I completely agree. I think there could have been some major issues with their questionnaire. It was 93 items long. With so many questions I feel that this could have led to a rushed, "get it over with" attitude, causing inadequate data. However I also agree that the questionnaire should have focused on specific details on whom is feeling discriminated against and on what level. It is ridiculous to create such an article without having being indefinitely positive with your results and questioning the conclusions. With that in mind I feel that officials and professors should address this topic and should of gave light to what they plan to do in the future to fix these issues. Whether it be a new questionnaire to tend to specific issues or create an action plan. Either way, this was a inconclusive article. I think if 79 percent represent a big number of people who feel comfortable with their life than the ones who are uncomfortable on learning and working at UC. But when we look on this things ethically, we have to consider even about others who feel uncomfortable. If there are any kind of offense, exclusion and intimidating I think they have to make sure that they make an end of all those so that everyone should feel comfortable in working and learning at UC. The article says that 24% reported negative feedback; 24% doesn't seem like a lot to some, but the fact that 42% OF that 24% reported being bullied or intimated is not okay and should be taken care of. I agree. It is an especially scary number when you take into account that the article said the survey did not receive many responses. This is obviously a serious problem not only in California but at universities all over the country. At Park, we celebrate diversity and try to welcome everyone without judgment. I wish others would adopt the same mindset. I was not very surprised to read that so many people reported they felt uncomfortable or harassed on campus. I think that a lot of schools do many initiatives to try to reduce hostility between different groups, but in the end, humans are humans and are bound to get into conflict with one another no matter what programs are on offer. You can look back in history and see that it has always been the same and humans have marginalized one another throughout time. It is sad, but true and this article reveals the statistics to back it up. Yes, i agree with that too. I guess I didn't completely take that into consideration. It is sad that conflicts are inevitable; but campuses are doing a lot to control it, and the more they try and control it, the better. I came to United States because I was looking to open my vision. It was based on learning how different cultures live into the earth and what can I extract from that. Of course I came to the rigth place because my university is characterized by having many representatives of different countries and also cultures. Learning about other cultures help us to have a better perspective on what do we do well and what we must learn from others. Also it help us to understand how humans works or how humans change by the places that they were born. Also this would help us in a future to have better relationships with our mates of the same human race. I like that people argue against ''governments'' for such a noble cuase. I would like to be there and give my opinion about it and why I believe it is important to have different cultures arround us. 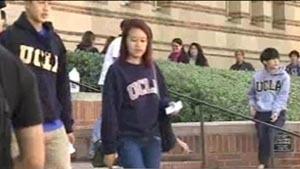 Like UCLA, Park has been blessed with a diverse number of students who all bring different cultures and norms from their home countries. And so it is important that we learn to respect the ways of life of others where as international students should also learn the American way of life. After all, we are all here to learn and better understand each other. It is also important to know that not everyone is going to respect your ideas and ways and therefore there is bound to be some misunderstanding which might be the base of the so called racial or ethnic bullying. All in all I think diversity should be a factor to be cheered on rather than looked down at. Regardless of race diversity I don't think anyone should be made to feel uncomfortable in an educational setting. Most (because not everyone really wants to be in college, May just be obligated to be) are there to get passing grades and get on with their chosen career. I know diversity within schools is important but like it was previously mentioned it can take away from those specific students some opportunities that were available at some point and then taken away or used up by the growing numbers. My school is more ethnic backgrounds than I have ever seen. I haven't been to many schools, so it's not surprising, but to see all the different backgrounds makes believe there might be hope for the future generations. It was interesting to learn that there are so many branches off of UC. If managers and directors have seen the points of weaknesses its better to make an improvement as they have plan to do, so that everyone can be satisfied with the ruling system without any complaining at school administration, stuffs as well as faculty. I found it interesting that UCLA is comprised of ten campuses. The statistical value of the results shows drastic visionary differences. Compiled results showed that roughly graduate and undergraduate students were similar in their satisfaction of diversity, however there is a drastic difference with professors of a professional level showing a twenty percent difference in their diversity satisfaction. Something is strange in the drastic difference of the results. What I also see is that the questionnaire was 93 items long. That is a huge questionnaire. Being that these questionnaires were sent through email I realize that there could be a few errors. I think the layout of the questionnaire in an uncontrolled environment plays a huge role into these factors and I wonder if there were incentives to take the test, lending to a rushed “get it over with” attitude. However, these are the results that were found, and it think it would be interesting to know their action plans to tend to these issues. They have found and concluded that there are huge issues on their campuses, it would have been nice to see their stance on the results and what they plan on doing to change it. I totally agree with you! coming to america to study have changed my life!! !